Gold prices rose in 2012, but at 9.5% the returns were not as impressive as in the past few years. Most experts believe that while gold will rise in 2013 but pace may come down. 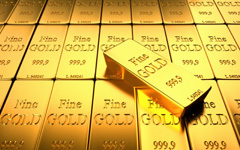 To reduce overall gold demand government and the RBI has taken various steps in 2012. First step was doubling import duty on gold another step was to make PAN card mandatory for purchasing jewellery worth more than Rs 2 lakh. A committee has been set up to devise gold-linked financial instruments. These steps has helped bit but not much gold demand is reduced by 19% and remain around 800 tonnes by end of 2012 compare to 986 tonnes in 2011. Most of the people think that gold price has increased by 9.5% compare to 2011. If we consider in terms of Indian rupee our calculation is correct but if you consider gold value in terms of direct dollar($) value gold price has reduced by 11.9%. Look at following table to clear your doubts. In actual sense rise in the price of gold in India is more due to INR depreciation than demand. INR has depreciated by 19.5 percent against the USD. This depreciation has cause rise in import prices of gold, leading to rising gold prices in INR terms. So, gold price in India is high due to INR depreciation. Clarity is yet to emerge on some of the factors that pushed up gold prices, such as the Euro debt crisis, US fiscal cliff, as well as other geo-political issues. The rupee-dollar exchange rate is major factor influencing domestic gold prices. If you see 1 year gold price graph shown below gold price is nearly unpredictable in 2012 and mostly volatile. But if you see latest gold price prediction by experts than most of expert believes that gold price will gradually increase and trade between 1800$ to 1900$ in 2013. Although many experts believe that gold price will increase in dollar, INR gold price likely to remain steady by 28,000-31,000 Rs/- in initial months of 2013. What option to select if you want to purchase gold in 2013? As per expert one can keep 5-20% gold allocation in portfolio. So if you have 5-20% gold in your portfolio you may skip investment in gold this year. If you are planning to invest in gold this year and your plan is to buy jewellery, don’t invest in gold saving schemes being offered by jewellery houses. This involves you paying 11 instalments and the jeweller paying the 12th. However, your money does not earn any interest for 11 months. Worse, you get to buy gold at the price prevailing at the end of the year, so you don’t gain from any upside. If your objective is pure investment in gold than GOLD ETF is best option. However you require demat account with broker. Also you have to buy fix multiple of 1g. To avoid this hassles of demat account you may buy gold funds that invest in gold ETFs. However, these funds add another layer of charges for the investor and return will be less compare to gold ETF. 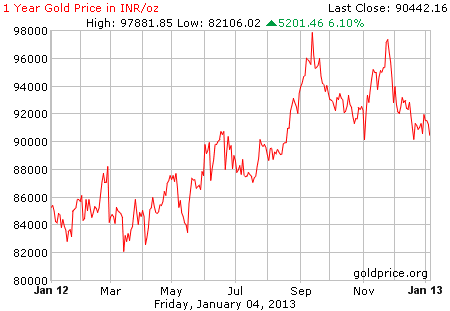 As far as expert opinion goes gold will underperform in 2013 and likely to be in range of 28,000 Rs/- to 33,000 Rs/-. You mean to say gold will not provide good return in 2013.